What are the Main Uses of an Aqua Cutter Robot? What are Aqua Cutter Robots used for? The Aqua Cutter robot is known for its ease of use, versatility and productivity. Here at Hydroblast we use the Aqua Cutter 410A Evolution as it is the world’s smallest hydrodemolition robot designed to replace the traditional method of hand-lancing which is a very physically demanding form of hydrodemolition which can cause fatigue among operators. 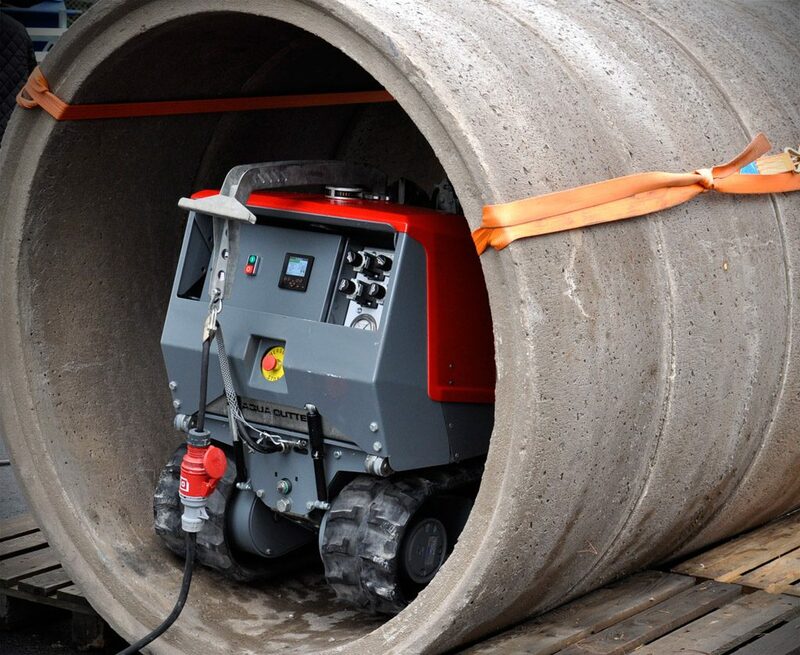 The Compact design of Aqua Cutter Robots allows for operations such as tunnel work or concrete removal in contaminated areas such as waste water plants. The Aqua Cutter 410A is also a lightweight model allowing for use on structures such as scaffolding. Where can the Aqua Cutter Robot be used? Aqua Cutter Robots are used widely for buildings and structures when concrete removal is needed as the Evolution system allows for precise programming, allowing you to cut in close proximity to sensitive equipment as well as allowing you to program the system to cut a set amount. The Aqua Cutter 410A features an articulated arm that can reach up to 9.8ft (3m) and features a 5ft (1.5m) front shroud which is rubber lined for increased noise reduction and is also used as a splash guard. As well as being very lightweight the Aqua Cutter robot also functions with a number of tools that make the Aqua Cutter Robot perfect for tunnel operation. Within nuclear power plants the Aqua Cutter robot can be used to prepare surfaces of pump casings and coatings and can also remove corrosion from the exterior surfaces of water cooling pumps. Hydrodemolition can also be used for concrete removal on jetties or marine structures that may require maintenance. We use the Aqua Cutter Robots within petrochemical plants as they are able to cold cut without any heat or sparks. We are then able to cut in to storage tanks, pipelines and structural steel which are located in volatile atmospheres. The robots are often used within tank and vessel cleaning as they are a form of remote controlled jetting equipment. 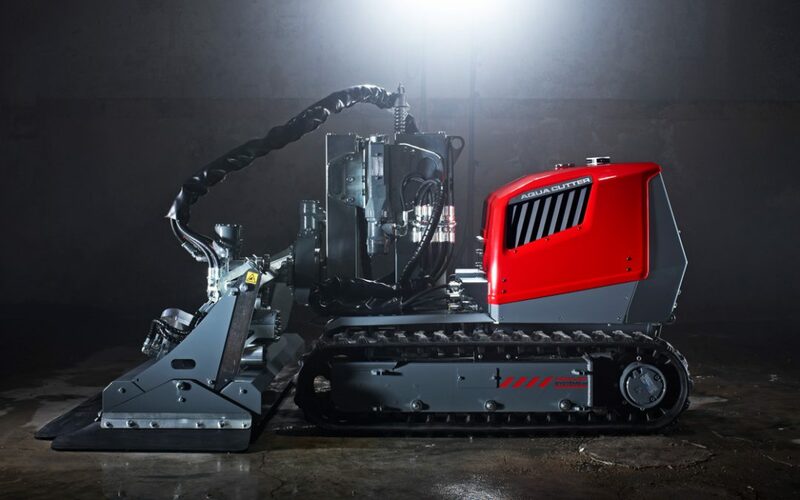 Hydrodemolition robots can also be used for pipe cleaning through straight sections, T junctions or multiple bends to remove a number of different build-ups. Aqua Cutter Robots can be used within waste water plants to remove concrete, grout, tree roots and material blockages from drains or sewers without damaging the pipe material as well as being able to remove concrete from around water pipes. The Aqua Cutter robots are often used when waste products are present, as it protects the crew from being exposed to gases within very confined spaces. As mentioned above the Aqua Cutter Robot is perfect for tight spaces and the Evolution model allows you to control the cutter using highly computerised robotic management making advanced operations easier to complete. The Evolution control system allows you to program geometrical figures such as circles, triangles and squares making it perfect for complicated operations. The Evolution control system is the most sophisticated and flexible system available on the market for hydrodemolition robots. Want to know more about the powerful capabilities of the Aqua Cutter Robot? Contact us today on 01677 428786 or email us at [email protected] and we will be happy to provide you with more information. We look forward to hearing from you. Want to find out more about Hydrodemolition? Visit our Hydrodemolition page today.